The Black Keys are an American rock duo formed in Akron, Ohio, in 2001. 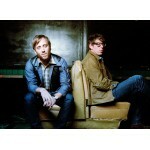 The group consists of Dan Auerbach (guitar, vocals) and Patrick Carney (drums). The duo began as an independent act, recording music in basements and self-producing their records, before they eventually emerged as one of the most popular garage rock artists during a second wave of the genre's revival in the 2010s. The band's raw blues rock sound draws heavily from Auerbach's blues influences, including Junior Kimbrough, Howlin' Wolf, and Robert Johnson. The group's commercial breakthrough came in 2010 with Brothers, which along with its popular single "Tighten Up", won three Grammy Awards. Their 2011 follow-up El Camino received strong reviews and peaked at number two on the Billboard 200 chart, leading to the first arena concert tour of the band's career, the El Camino Tour. The album and its hit single "Lonely Boy" won three Grammy Awards. In 2014, they released their eighth album, Turn Blue, their first number-one record in the US and Australia.